Buncombe County deed- book 7, page 113, April 23, 1802, 100 acres bought from Richard Hill on Woods Creek (now Garren Creek) in Fairview, North Carolina. He was Justice of the Peace from 1809-1817. He was appointed Postmaster of Swannanoa. He was elected to the County Board of Commissioners. He was Captain of the Militia. He was Treasurer of the Board of Wardens. He was elected to represent Buncombe County in the lower house of the North Carolina General Assembly in 1818, 1819, 1820, and 1823. He was deacon and clerk of Franklin Baptist Church till 1834. He was active in bringing the Word of God to the Cherokees. The Valley River Baptist Association was formed in 1839 and he was clerk till 1845. On August 14, 1865, at the age of 86 he was appointed Justice of the Peace. The following is "A Short Memoir of the Life of James Whitaker, Esq. - written by himself". (His autobiography). James Whitaker is the son of Joshua and Mary Whitaker - was born in the State of North Carolina, Rowan County, near the place where Lexington now stands in Davidson County, on the third day of April, 1779, and was the youngest of four brothers and two sisters. Their names were John, Joshua, William, Sarah and Mary. My parents were poor but honest and industrious and therefore I was taught to work in early life upon a small farm which yielded a sufficient support for the family. As such, the chances for my Education were very small. At the age of six years however, I could read and begin to write. But in my tenth year I had to leave school entirely having only went occasionally during that period. My other brothers by this time were all grown and some or all of them married and left home, so I was called to the farm where I remained until the death of my father which happened on the lst of May, 1798 when I was in my nineteenth year. My brothers and one sister were all married. My youngest sister and myself and Mother now constituted the family and lived upon the farm.... the care and management entirely fell on me and which I attended to with care and industry for three years, or until September 1800. 1 was like many other young persons very wild in my youth, but not however, profane, having always possest a reverence for God and Religion and from almost my infancy had frequent checks of conscience for crime and I believe never permitted myself to go to sleep at night without first putting up some kind of short prayer that God would preserve my life till morning or should I die that he would take me to Himself. MY raising was rather under the high Church order and accordingly, "My Father I think in my fourth or fifth year had me sprinkled (or Baptised as he called it) by Mr. Hinkle, a preacher of the Church of England having my Godfather and Godmother in the usual way. These things however had but little weight on my mind only it served to make me learn my Catechism, etc. It might also have assisted as one cause that led me to so early to study on the subject of Religion, and ...."Yself, and soon found that for myself I must stand or fall and .... infant sprinkling as well as Godfather and Godmother were as I believe only inventions of men and unnecessary to our day,added to the Doctrines of the church without authority from the Holy Scriptures and served to lead the..... unthinking part of mankind. When I was in my thirteenth year a scene of unusual seriousness pervaded my mind. I felt some convictions for sin with a consciousness of quilt and was made to view seriously the shortness of life and certainty of death. While under these impressions of mind it was my evening employment for some months to view the setting sun with intense anxiety believing that it might be the last time I should see that bright Luminary and that I should never again witness his Rising to cheer the earth anymore. But after passing the summer in this way and some more shorter periods and also from a deep sense of the past goodness of God and a firm persuasion that his mercies would not fail and under a most solemn promise on my part that if the Lord should spare me until I should marry and become settled that then I would become religious in a proper sense of the word and serve God with a full purpose of heart. And thus it was that the disorders of my troubled conscience was made to grow easy for the moment. From this time perhaps for the space of six or seven years the mind that had been so torn to pieces became settled and calm. But surely under a false hope! But so it was I did hope and that hope was founded on the Everlasting and ...... Love of God. The faith of the universalism, the rock upon which thousands have sliden (?) and fallen to rise no more, the religion of my neighborhood at this time consisted in little more than forms. It was therefore more easy for persons of my age to slide off into vanity and crime. Cherokee County was formed in 1839 from Macon County. At that time, Cherokee County included all of present day Cherokee County as well as present Graham County and present Clay County. 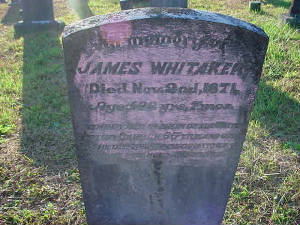 James Whitaker, Sr. was an early settler of Fairview. Born April 3, 1779 on Swearing Creek in the Jersey Settlement of Rowan (now Davidson) County, North Carolina, he was the youngest child of Joshua Whitaker, Sr. and his wife Mary Reed. James was forced to quit school when he was ten years old due to his father's failing health (heart dropsy). According to his autobiography, at the age of 13 he became severely depressed. He "viewed the setting sun with intense anxiety, believing it might be the last time I would see that intense luminary!" Finally, James made a "most solemn promise" to God "that if the Lord would spare me until I should marry and become settled, that I would become religious in a proper sense of the work and serve God with a full purpose of heart." After making this promise, his depression disappeared. James stayed home on the farm with his parents until his father died in 1798. By then, all his brothers and sisters had married and most had moved to Fairview. But 19-year-old James and his mother, Mary, remained at home. In September 1800, James married Mary "Polly" Walker, daughter of Howard Walker of Wilkes County, North Carolina. (Mary was born in North Carolina on June 26, 1779.) A few days after his marriage, James, his wife, and his mother left for Fairview to be with the rest of his friends and relatives. On April 23, 1802, he acquired 100 acres of land from Richard Hill on Woods Creek (now Garren Creek). He settled down on this farm and began to raise his family. One day in 1803, while plowing, James recalled the promise he made to God when he was thirteen years old. This upset him greatly and he spent several years trying to decide what to do. His wife, Polly, joined French Broad Baptist Church in what is now west Henderson County (which was the nearest Baptist Church at the time) in October 1803. James did not join until May 1806. One week later, on May 10, 1806, the Cane Creek (now Fairview) Baptist Church was formed, and James and Polly became charter members. James was appointed the church's first deacon and clerk-treasurer. The Reverend Humphrey Posey and James wrote the articles of faith for the church. In March 1807, James moved his family to Swannanoa, in what is now called Lytle Cove. Swannanoa was a Presbyterian community and had no Baptist church until the 1880's. Although his new home was 10 miles away (that's walking straight over the top of the mountain) from Cane Creek Baptist Church, he continued to be one of the church's most active members. In 1812, he became the Clerk of the French Broad Baptist Association. That year he wrote his first Circular Letter for the Baptist Church, one of at least fifteen that were to come from his pen. It was entitled "The Duty of Church Members, One to the Other." In community affairs, James served as a Justice of the Peace from 1809 to 1817. He was appointed Postmaster of Swannanoa, was elected to the County Board of Commissioners, Captain of the Militia, and Treasurer of the Board of Wardens. He was elected to represent Buncombe County in the lower House of the North Carolina General Assembly in 1818, 1819, 1820, and 1823. In March 1825, James and 12 of his 13 children moved to a farm near Franklin in what is now Macon County. The next month, James and Polly were received by letter into the Franklin Baptist Church. When Macon County was formed in 1828, James Whitaker was on the first County Board of Commissioners. He represented Macon County in the General Assembly from 1828 to 1833. James also became involved in the county's road surveying. During this period, James was active with the Reverend Humphrey Posey in establishing new Baptist churches and with bringing the Word of God to the Cherokee. In 1830, James was appointed Clerk Treasurer of the Tuskaseege Baptist Association. In the book A Biography of a Southern Unionist by Jonathon Worth, James Whitaker is mentioned for his contributions toward equal representation in the General Assembly. In 1831, Whitaker called for the legislature to meet every two years instead of yearly, and for seats in the House of Commons to be based on the Federal Census population. In 1835, the North Carolina Constitution was amended to make both these changes. In March 1835, James Whitaker moved his family into what is now Cherokee County, North Carolina. For several years the surrounding settlement was called Jamesville after him. It was later changed to Valleytown, and then to Andrews. James and Polly joined the Valleytown Baptist Church that year, which had a mixed white and Indian congregation. He donated the land for the church's cemetery. The Valley River Baptist Association was formed in 1839, and James was the Clerk of the Association from 1839 to 1845. In 1838 and 1839, James lobbied for the creation of Cherokee County. He carried the resolution to the General Assembly, and when Cherokee County was formed, he became the County's first Clerk of Court and Recorder and Register of Deeds. He served his last term in the General Assembly in 1842 as the Cherokee-Macon County representative. 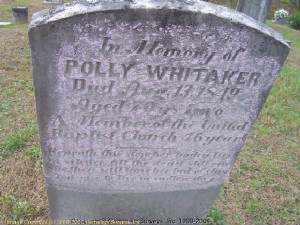 On August 14, 1849, Mary "Polly" Whitaker died, becoming the first person buried in the Valley River Baptist Church Cemetery. In the spring of 1853, James came back to Fairview for a visit. While here, he married Mary McBrayer, widow of his old friend, James McBrayer, on May 15. James and his second wife returned to his home in Cherokee County. In August 1865, at the age of 86, James was appointed a Justice of the Peace. The next month, he was appointed to take amnesty oaths from Civil War soldiers for the Valley River Area. In 1867, James fell and dislocated his hip. He was never able to walk without crutches again, and his health began to decline. On October 31, 1871, he was confined to bed. A few hours before his death, he clasped his hands and shouted: "Glory! Glory! Glory!" He said he saw his home in heaven and tried to describe it. Someone asked if he was happy and he shouted: "Oh, yes! Happy! Happy!" At 4:50 p.m. on November 3, James died at the age of 92. The following March 20, his second wife, Mary McBrayer Whitaker, also died. James and both of his wives are buried in Valley River Cemetery in Andrews. James Whitaker, Sr. was described as being a man "of great intellect, high character, and unsullied reputation." He was said to have done as much for the Baptist Church as any man in the state. 1. Sarah (1801-38). Born in Fairview. Married Benjamin Mann. Died in McDowell County, North Carolina. 2. William (born 1803 in Fairview). Married Anna Ervin in Macon County, North Carolina, and moved to Georgia. 3. James, Jr. (1804-99). Born in Fairview. Married Nancy Kyle. Died in Andrews. 4. Elizabeth (1806-52). Born in Fairview. Married Spencer Shearer. In 1843, they moved to Cypress, Titus (now Franklin County), Texas. She died there of pneumonia. 5. Jesse (1808-91). Born in Swannanoa. Married Caroline Ervin. They moved to Georgia. He died in Whitfield County, Georgia. 6. Joshua (1809-86). Born in Swannanoa. Married Lydia Burgin. They moved to Edneyville in Henderson County, North Carolina, where he died. 7. Mary "Polly" (1812-1902). Born in Swannanoa. Married Samuel Jarvis. They moved to Cherokee County, Georgia. Died in Georgia. 8. Stephen (1814-1900). Born in Swannanoa. Married Elizabeth Taylor. They lived in Andrews. Stephen, a Major in the Confederate Army, led the last battle of the Civil War, the "Battle of Hanging Dog." He died in Andrews. 9. Lettice (born 1816 in Swannanoa). Married Garret Taylor. 10. John (born 1818 in Swannanoa). The first Postmaster of what is now Andrews. Moved to Arkansas, and later Oklahoma. Worked for years on Mississippi River boats. 11. Silas (1820-1916). Born in Swannanoa. Married Rebecca Allison. They lived in Cherrylog in Gilmer County, Georgia. 12. Adeline (1822-1907). Born in Swannanoa. Married Robert Paul Dunkin. They moved to Loudon County, Tennessee, where she died. 13. Carolina (Born 1825 in Swannanoa). Married John Kimsey. Children Sarah WHITAKER b: 25 SEP 1801 William WHITAKER b: 23 FEB 1803 James Jr WHITAKER b: 15 AUG 1804 in Fairview, Buncombe County, North Carolina Elizabeth WHITAKER b: 8 MAY 1806 Jesse WHITAKER b: 26 FEB 1808 Joshua WHITAKER b: 4 OCT 1809 in Swannanoa, Buncombe County, North Carolina Mary Polly WHITAKER b: 12 MAR 1812 Steven WHITAKER b: 9 FEB 1814 in North Carolina Lettice WHITAKER b: 10 JAN 1816 John WHITAKER b: 2 FEB 1818 Adeline WHITAKER b: 18 AUG 1822 in Buncombe, North Carolina Caroline WHITAKER b: 7 JAN 1825 Silas WHITAKER b: 20 JUL 1820 in Swannanoa, Buncombe County, North Carolina. Credits: I am indebted to Carolyn Ellertson, Bruce Whitaker, Linda Anders, Barry LeRoy Burdett, Bev Otis, and the Macon County Historical Society & Museum for their dedication, assistance and contributions with the James and Stephen Whitaker material and information.